Guyanese Ivelaw Griffith, an expert in Caribbean security issues, has been named as the next president of Fort Valley State University in middle Georgia, USA. The Associated Press reported that Griffith is currently the provost and senior vice president at York College of the City University of New York. He was the sole finalist, and the board’s vote on Friday was unanimous, AP said. University officials say Griffith has served in his current position since 2007 and has upped the number of full-time faculty at York College by 30 percent, reorganized the academic division and set up an undergraduate student research programme. A specialist on Caribbean security, drugs, and crime issues, he has written and edited Strategy and Security in the Caribbean (Praeger 1991), The Quest for Security in the Caribbean (M.E. Sharpe 1993), Caribbean Security on The Eve of the Twenty First Century (National Defense University Press 1996), Democracy and Human Rights in the Caribbean (Westview Press 1997), Drugs and Security in the Caribbean: Sovereignty Under Siege, (Penn State Press 1997), The Political Economy of Drugs in the Caribbean, (Macmillan Publishers 2000), and Caribbean Security in the Age of Terror (Ian Randle Publishers 2004). Ivelaw also has published more than 50 articles in various scholarly journals and magazines, including Journal of Inter-American Studies and World Affairs, Dickinson Journal of International Law, Journal of Commonwealth and Comparative Politics, University of Miami Law Review, International Journal, Mershon International Studies Review, Caribbean Perspectives, Conflict Quarterly, Latin American Research Review, Caribbean Quarterly, Naval War College Review, The Round Table, Caribbean Affairs, Security and Defense Studies Review, International Journal, Journal of the Association of Caribbean Commissioners of Police, Third World Quarterly, Low Intensity Conflict and Law Enforcement, Joint Force Quarterly, and Social and Economic Studies. He has been quoted in numerous media, including TIME, The New York Times, Los Angeles Times, Miami Herald, The Washington Post, The Gleaner (Jamaica), Trinidad Guardian, Stabroek News (Guyana), The Nation (Barbados), Christian Science Monitor, Dallas Morning News, The New York Carib News, Tages-Anzeiger (Switzerland), U.S. News and World Report, New Jersey Star Ledger, The Fort Lauderdale Sun Sentinel, the Trinidad Express, El Universal (Venezuela), and La Prensa Gráfica (El Salvador). 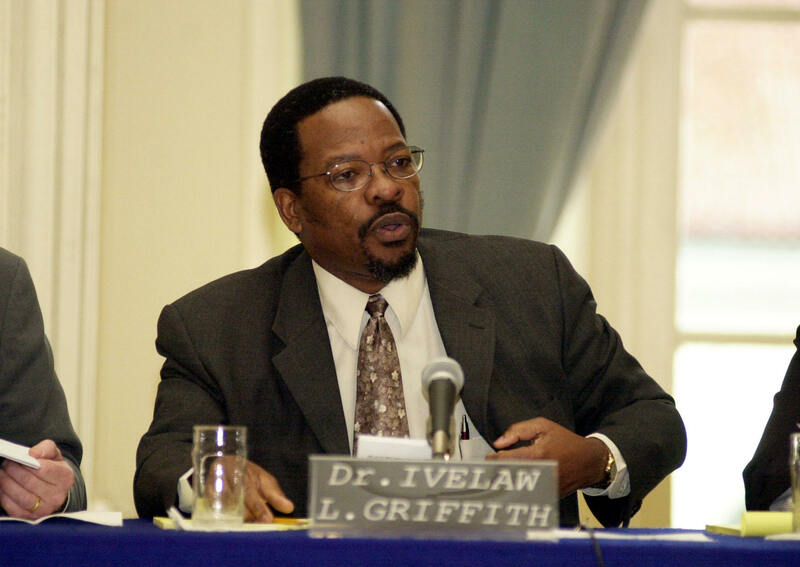 Dr. Griffith is a past president of the Caribbean Studies Association. The Center for Hemispheric Defense Studies in Washington, DC, the Royal Military College of Canada, and the George Marshall European Center for Security Studies in Germany are places Ivelaw has been a Visiting Scholar and he has been a consultant to Canada’s Foreign Ministry, USAID, and other entities. A member of the editorial board of Security and Defense Studies Review, he has testified before the U.S. Congress on Caribbean security issues. Previously he was budget dean of the College of Arts and Sciences at Florida International University (FIU), Dean of The Honors College at FIU, and Provost at Radford University in Virginia.Ivelaw also serves on the National Steering Committee of the American Association of State Colleges and Universities’ project on Re-Imagining Undergraduate Education in the United States. A member of the 100 Black Men of Long Island, he also serves on the Vestry (Board of Directors) of St. George’s Episcopal Church in Hempstead, Long Island, and on the Board of Directors of the Queens-based Jamaica Center for Arts and Learning. Still an active scholar,Ivelaw’s recent work includes (1) an entry in The Encyclopedia of Drugs, Alcohol, and Addictive Behavior (2009), (2) studies on Surinamese geopolitics and Guyanese national security in 2011, and (3) Opinions in New York Carib News, Latin American Advisor, Venezuela’s El Universal, Jamaica’s Gleaner, and other media in 2010, 2011, and 2012.